CA GYANGURU brings you accounting standard notes in pdf format. These notes are mobile compatible, so students of IPCC and final can download these accounting standards notes in mobile. These are ultra short revision notes for accounting standards useful for last minute revision. Students can download ca IPCC and ca final accounts note from the download link below. Section 77. Duty to register charges, etc. Section 78. Application for registration of charge. Section 79. Section 77 to apply in certain matters. Section 81. Register of charges to be kept by Registrar. Section 82. Company to report satisfaction of charge. Section 83. Power of Registrar to make entries of satisfaction and release in absence of intimation from company. Section 84. Intimation of appointment of receiver or manager. Section 85. Company‘s register of charges. Section 86. Punishment for contravention. CA GYAN GURU brings you CA FINAL LAW NOTES. These LAW notes are of topic director which is covered under SECTION 149 to 172 of companies act 2013. These CA FINAL company law notes are latest as per may Nov 2017 attempts and are ultra hsort. 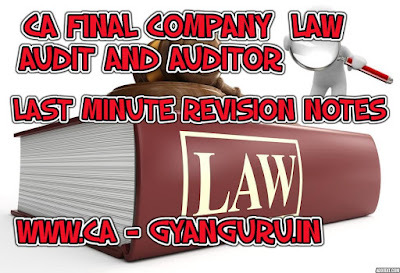 CA gyan guru brings you CA FINAL LAW notes AND CA IPCC law notes of topic company law topic AUDIT, and AUDITORS RULE. 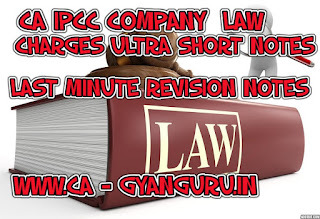 CA GYANGURU brings you IPCC NOTES of COMPANY LAW for Exams. 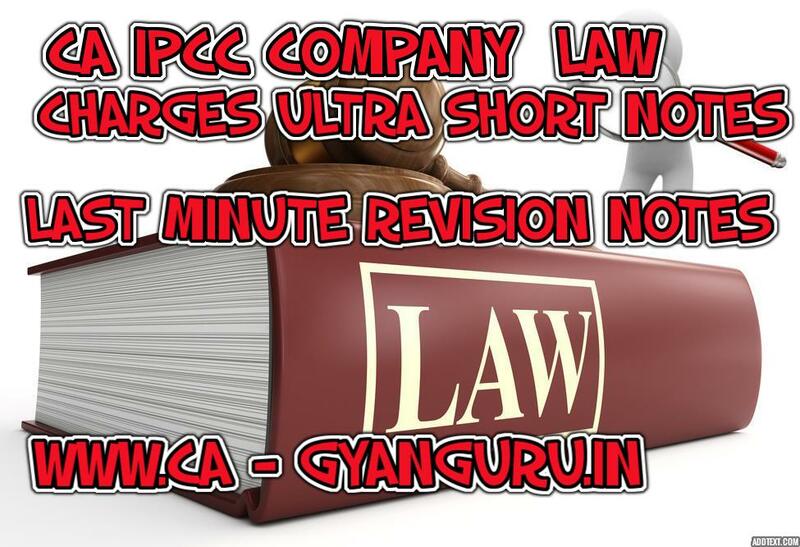 These IPCC notes are For topic COMPANY LAW and are for last minute revision. These IPCC LAW notes are relevant for MAY-NOV 2017 exams. 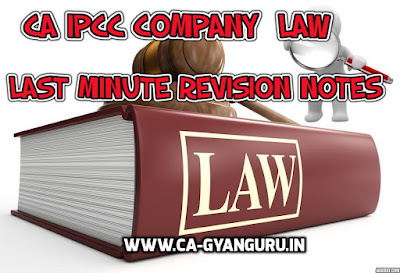 These IPCC LAW notes are ultra short and concise which will help the students of ICAI IPCC to revise whole company law in short span of time. One of the students of CPT IPCC CA FINAL often face is that their registration letter or acknowledgments don reach them on time. Or sometimes you need it urgently and all your documents are at home. So from below link you can find all letters online. ICAI providing following registration letters online !! Article: Registration as an Articled Assistant Under Direct Entry Scheme /Transition Scheme of Intermediate (Integrated Professional Competence) Course. CPT: Acknowledgement Letter for payment of fees (CPT). IIPCC: Confirmation of your Provisional Registration in Intermediate (Integrated Professional Competence) Course – under Direct Entry Scheme. IPCC-ATC: Acknowledgement Letter for payment of fees (IPCC-ATC). IPCC-CON: Acknowledgement Letter for payment of fees (IPCC-CON). IPCC: Acknowledgement Letter for payment of fees (IPCC). ITTTR: Acknowledgement Letter for payment of fees (ITTTR). We have regularly been requested by to students on HOW TO PRESENT CASE BASED QUESTIONS. 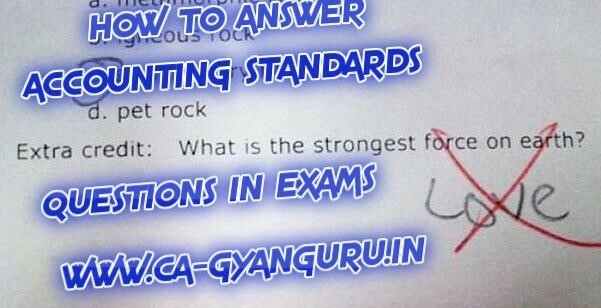 Problems which students of CA IPCC and FINAL face are that they know the answers but are not able to express it adequately in writing thereby not scoring good marks.If we generally observe on an average, ICAI asks 3-35 marks paper from accounting standard in CA IPCC and CA Final Accounts exam. AND around 50-60 in CA IPCC and Final LAW exams. Today we are sharing Presentation tip for CA IPCC FINAL law audit and accounts exam. what AS/SA/LAW says and what company has done in para 2 and whether they are correct or not. This will only come in few questions having the alternative solution: Some questions are drafted in the way that they don't provide full information. In that case, you have to put assumption if a company has done this then para 3 conclusion if Company has not done this then para 4 conclusions. Give more spacing so as to make reading easier and fast by the ICAI checker. Always underline the important parts like para number or text on which answer is based. Generally, ICAI Checker does not have spare time most probably he will read the underline part and will award marks. Students who followed these presentation tips got 4 marks awarded out of five.